In 1974, a teenage Mohsen Makhmalbaf stabbed a policeman, Mirhadi Tayebi, in an attempt to disarm him, a rebellious act against the Shah. He went to prison for his efforts. 20 years later, he attempts to recreate the scene on film. He hires a young actor to play himself, and recruits the policeman to direct his own young counterpart. In the role of his cousin, an accomplice in the event, he tries to get the daughter of his real cousin but he is turned down so he gets his young counterpart’s cousin. Oh, and depending on which account you believe, the policeman is played by someone other than the real policeman, and the girl who ends up playing his cousin actually is the daughter of his real cousin. Knowing that some of the players may or may not be the “real” people involved is not a prerequisite for enjoying this film, but it adds another delightful layer to an already intricately layered construction. It has the semblance of a documentary but never pretends to be one. When the policeman takes his younger self to the tailor for a uniform, the tailor exclaims, “It’s for a film! Why didn’t you say so?”… but of course he knows the cameras are on him, and we are reminded that we’re witnessing a mock dramatization of preparations for a mock recreation. It’s a world where reality and fiction and memory are constantly folding over each other. Two of the young actors meet for the first time and exchange pleasantries, then suddenly (with no one “watching”) they are acting out the conspiracy of 20 years earlier. And again we’re shaken by the schisms between real-real, fake-real and fake-fake. And all these self-reflexive meta games never feel like indulgent wankery. It has humor and warmth throughout, especially from Tayebi, who wants the better-looking youngster to play himself (not just for his looks, of course!) and is prone to sulking. 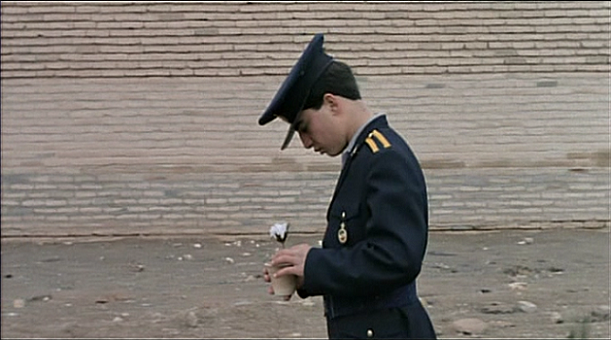 But Makhmalbaf generously devotes much of the screen time (perhaps even most of it) to the policeman, for it is Tayebi’s story as much as his own. And Tayebi represents the capacity for cinema to be wish fulfillment, trying via his actor proxy to rekindle what he saw as a budding romance. And in the end, in what may well be the greatest freeze-frame I’ve ever seen, the film is a form of wish fulfillment, rewriting history with new perspective, with youthful compassion and optimism. This entry was posted on July 18, 2012 at 9:15 pm	and is filed under Movie Reviews. You can follow any responses to this entry through the RSS 2.0 feed. You can leave a response, or trackback from your own site.